Although I’m in love with my finished shawl — I even wore it while I waited in line for 3 hours for a signing of the new “Game of Thrones” book! outside, in July! — I have to say, with all respect, the pattern as it is currently available is almost unusable. It is rife with errors, omissions, and confusing instructions. 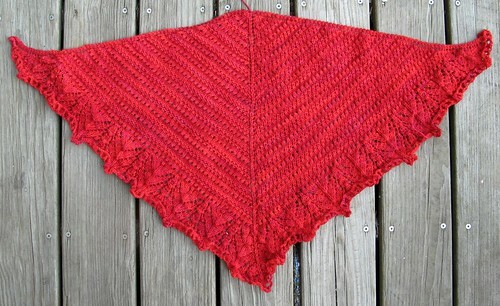 Were it not for great notes on existing projects on Ravelry, it would have been nearly impossible to follow. Even with those notes, I still had trouble sorting out which parts of the pattern were right and which were wrong. 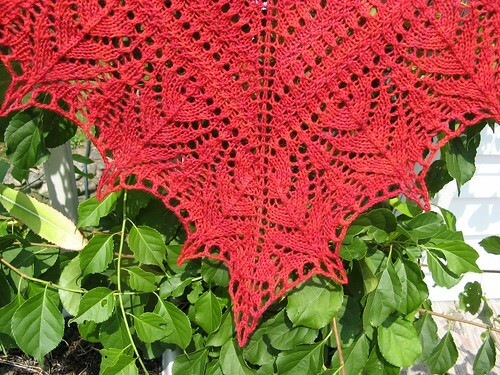 The lace charts included in the pattern were non-standard and had errors and conflicting design (right vs. left half of shawl). I ended up making fresh charts in excel to show how I decided to do the pattern … I made enough changes that you could argue that my shawl isn’t really a “rough seas” at all. Repeated Rows 1 thru 10, eleven times total — 231 sts altogether, 113 on each “side” (not including 2 edge sts and center spine st). I saw no reason to use the increase rows as written, since I already had the right # of sts. 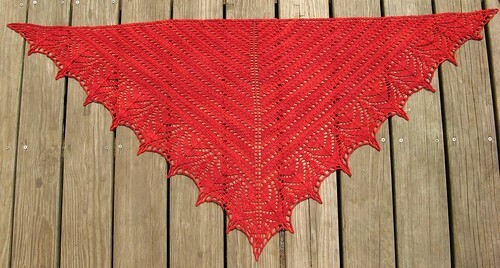 I used the ssk/k2tog orientation from the “right side of shawl” chart (they are reversed on the “left side” chart). I opted for a s2kp rather than a sk2p, because I like the more centered look with a vertical line. I extended the lace pattern into the corners to avoid a big chunk of un-patterned stockinette. I added an increasing section on the edge (to use the edging YOs). I used my corrected/altered “right side” chart for both sides, thus avoiding the problems with the “left side” chart, including the pattern repeat box being one stitch too large, and also the missing column of ssk’s near the center increases. I decided to do three (rather than two) repeats of the edging to better balance the shawl (and use up more of my skein). I finished with one additional repeat of row #1 to “finish” the points on the pattern. 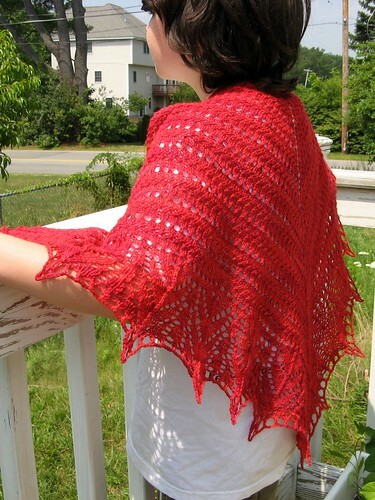 I used a decorative crochet finish rather than just binding off, for prettiness and to avert curling on the FO. In the “points” I (DC, ch5, DC) in the stitch below the point. … except for the THREE sts at the point of the lozenges, where I (DC, ch3) with the DC going through THREE sts (so it would be centered. I’ve made my version of the rough seas charts available on Google docs. 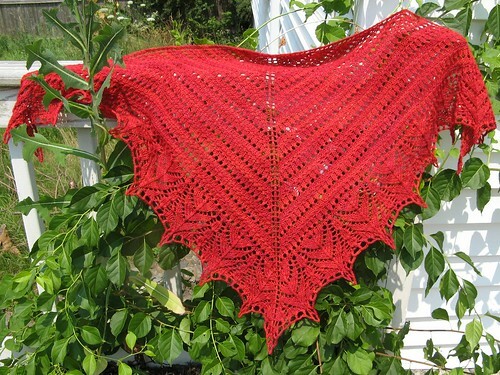 I thought this shawl is a great example of how much blocking can change a knitted object. Here you see the unblocked shawl: you can barely see the eyelet rows in the body, and the lace and crochet edging looks lumpy and curled. You can see that it is about six boards across the wingspan. Here is a photo of the shawl while being blocked: you can see that I’ve straightened the top edge, and pulled out the points severely. I kept the triangle shape rather than morphing it into a more curved shape. 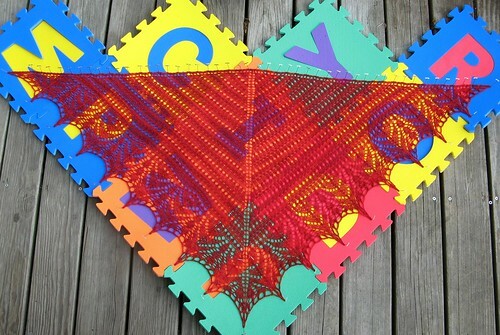 Here is the fully blocked and dried shawl — nearly 10 boards across! The yarn (superwash sock yarn) has held the blocking better than it has any right to. The points especially have stayed crisp and dramatic. Yay! 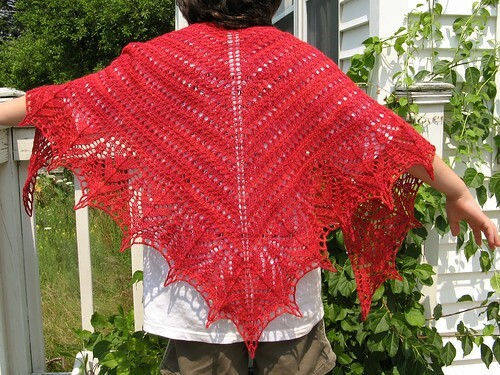 wow – it sounds like it was very rough sailing knitting this shawl. I guess sometimes free isn’t such a good deal! I’ve had great luck with free patterns … but it always pays to check others’ notes! Ugg I have tried to do the lace edging I don’t know how many times now! It just doesn’t add up I even undid the last set of 10 rows thinking I had done something wrong and it still won’t work! I read charts fine but something isn’t adding up. Would you share your chart or do you have any suggestions? My version of the chart is still up on google docs, I believe. Try here?